For any of my local readers... I hope your heat is on tonight. Wow it's cold. Ishkabibble! As a continuation to yesterday's post, here is a super quick and easy Halloween DIY. Possibly my favourite for Halloween so far... largely because it's more or less dressing up what I already had, using materials I also already had. So it was basically free! Gotta love that. 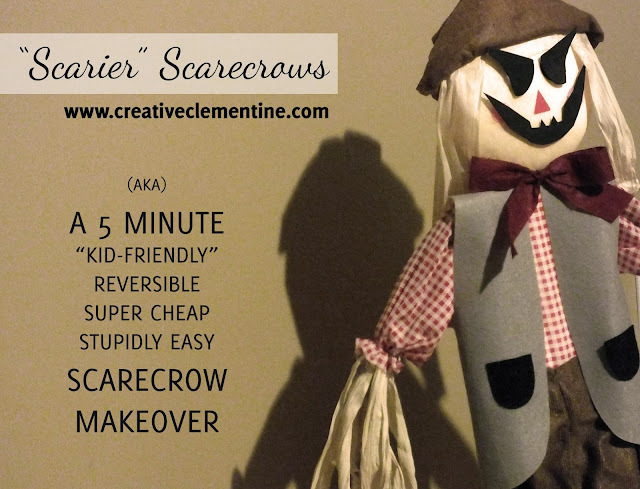 The inspiration for this ridiculously easy Scarecrow makeover was simple: I wanted my yard to slowly transition from cutesie happy-go-lucky autumn awesomeness into a creepy Halloween atmosphere..and then back again. And I'm kind of lazy when it comes to outdoor decor, so it needed to be extra simple and clever. I also (on top of everything else) wanted it to be something that I could, eventually, make legitimately creepy. Cuz, let's face it, this was designed with my four year old niece and nephew in mind... not so much my horror-buff beau. Enter a $4 Scarecrow I've had for two years, some handy self-adhering velcro, a pink marker and a semi-creepy face cut out of black foam. Cute rosy-cheeked scarecrow by day, "scarier" scarecrow by night. Easy peasy! In related news... I'm running out of time to show you all the cute-to-creepy transition that's happening in our front yard! Hopefully tomorrow I can snap some pics before the sun goes down.